17 11 2012 - SAN FRANCISCO – Economist - Visa, MasterCard and other big payment networks need not be victims in the shift towards digital cash if they play their cards right. Another milestone on the journey towards digital cash was passed on November 13th. That date marked the emergence from beta-testing in America of V.me, a “digital wallet” that holds multiple payment cards in a virtual repository. Instead of providing their personal details and card numbers to pay for stuff online, customers just enter a username and a password. The service is provided by Visa, a giant card-payment network whose headquarters is in the heart of Silicon Valley, close to a host of technology firms which would love to get their hands on a chunk of the global payments business. Card companies make a tempting target. Some, such as Visa, MasterCard and China’s UnionPay, manage credit, debit and prepaid cards issued by their members; others, such as American Express, pump out their own plastic. The amounts of credit and cash they process are mind-boggling. Last year some $6.7 trillion was channelled through credit cards managed by the networks, according to the Nilson Report, an industry newsletter. Throw in debit and prepaid cards and the number exceeds $15 trillion (see chart). Such sums explain why so many firms, from telecoms companies to retailers and start-ups such as Square, a new payments firm based in San Francisco, are determined to transform the way people pay for things. 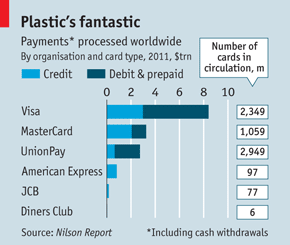 Some upstarts foresee a post-plastic world that will put a dent in card giants’ earnings. But the payment networks are not going to let that happen without a fight. In the short term new technology is actually boosting usage of plastic. Smartphone apps often require users to enter their card details to pay for services. Firms such as Square and PayPal have developed tiny card readers that plug into smart phones and allow small traders using their software to accept payments cheaply. Ed McLaughlin, who oversees emerging payments technologies at MasterCard, reckons such developments have added 1.2m new businesses over the past 12 months to the card firms’ list of merchants. But even if plastic cards eventually go the way of vinyl records, card networks should still prosper because they too are investing heavily in new technology and have several built-in advantages. Visa is betting its member banks can help it to narrow the gap with rivals like PayPal, for instance, which is part of eBay and has grown to 117m active users thanks in part to its use on the auction site. Over 50 financial institutions are supporting the launch of V.me, which accepts non-Visa cards in its wallet, too. MasterCard and others are also touting digital wallets, some of which can hold digital coupons and tickets as well as card details. Before long all of these wallets are likely to end up on mobile phones, which can be used to buy things in stores and other places. This is where firms such as Square, which has developed its own elegant and easy-to-use mobile wallet, and Google have been focusing plenty of energy. Jennifer Schulz, Visa’s global head of e-commerce, predicts there will be a shake-out that leaves only a few wallet providers standing. Thanks to their trusted brands, big budgets and payments savvy, one or more card companies will be among them. Card networks are also taking stakes in innovative firms to keep an eye on potentially disruptive technologies. Visa owns part of Square, which recently struck a deal with Starbucks to make its mobile-payment service available in 7,000 of the coffee chain’s outlets in America. Visa has also invested in Monitise, a mobile-banking specialist. American Express, for its part, has set up a $100m digital-commerce fund, one of whose investments is in iZettle, a Square-like firm based in Sweden. So far few have tried to create new payments systems from scratch. Those that have toyed with the idea, such as ISIS, a consortium of telecoms companies in America, have concluded it is far too costly and painful to deal with regulators, set up anti-fraud systems and so forth. (Last year all four big US card networks joined ISIS.) Fears about the security of new-fangled payment systems also play into the hands of established card firms. Still, they cannot relax. Bryan Keane, an analyst at Deutsche Bank, points out that rival digital wallets could promote alternatives to credit and debit cards, including stored-value cards and direct bank-account-to-bank-account payments. Big retailers in America have clubbed together to create their own digital wallet and are likely to prompt users to choose the payment options that are cheapest for the chains, by offering them incentives like coupons. Jack Dorsey, the boss of Square and a co-founder of Twitter, agrees that digital wallets will make the trade-offs between various payment options clearer to consumers and reckons this will force card networks to up their game. “They had a major innovation 60 years ago [when the charge card was created],” he says, “and there have been very, very few innovations since.” Some in the payments world might quibble with that but one thing they can all agree on is that the spread of mobile payments will bring many more customers. MasterCard’s Mr McLaughlin claims that 85% of commerce still involves cash and cheques. As mobile purchases take off, more of this activity will move online. The biggest prize of all lies in emerging markets, where a lack of financial infrastructure is hastening the rise of phone-based payments systems such as M-Pesa, which serves Kenya and several other markets. Visa has snapped up Fundamo, which specialises in payment services for the unbanked and underbanked in emerging markets; MasterCard has set up a joint venture called Wanda with Telefónica, a Spanish telecoms firm, which aims to boost mobile payments across Latin America. 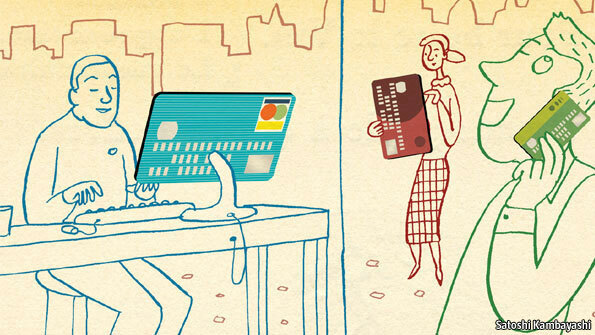 The payments world is changing fast but the card firms are not about to let rivals swipe their business.